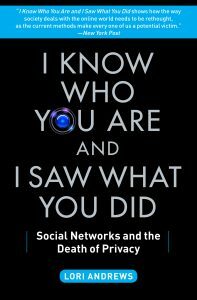 Through groundbreaking research, Andrews reveals how routinely colleges reject applicants due to personal information searches, robbers use vacation postings to target homes for break-ins, and lawyers scour our social media for information to use against us in court. And the legal system isn’t protecting us—in the thousands of privacy violations brought to trial, judges often rule against the victims. Providing expert advice and leading the charge to secure our rights, Andrews proposes a Social Network Constitution to protect us all. Now is the time to join her and take action—the very future of privacy is at stake.